Tucked away on a corner in Garwood, the new restaurant Loaded Burgers-N-BBQ has already made a name for itself by serving up some of the best burgers and barbecue around. Though it’s only been open since February, the small space often fills to capacity with customers clamoring for burgers, waffles, macaroni and cheese, and French fries. The fact that no shortcuts are taken in regards to the quality of food shines through in every dish. Jacob Han, one of the owners at Loaded, worked at Verizon for a number of years but attended culinary school on the weekends. Once he received his culinary degree Jacob devoted himself to cooking full-time. 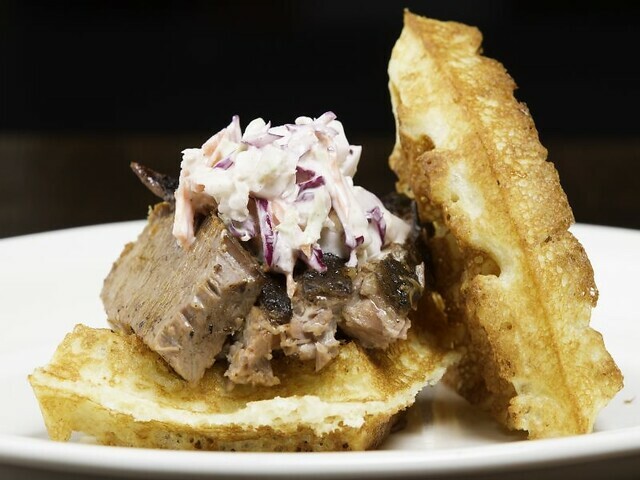 He honed his burger flipping skills at Huntley Taverne in Summit, and wanted to use that experience to provide high-quality burgers and barbecue in his own place. Jacob and his partner, Rob Jones, took it slow when they first opened, relying on customers to be impressed enough that they would continue to return and spread the word. 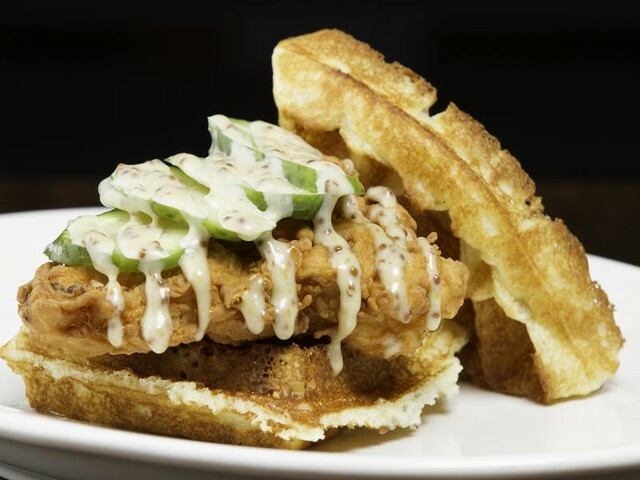 The current menu focuses on Loaded Burgers and Waffles. The burgers are made from natural ground beef and served on brioche buns. Customers can choose from a number of toppings, including avocado, sautéed mushrooms, caramelized onions, and a variety of cheeses. Oh, and don’t forget the maple cured bacon which is cured in house and is as delicious as it sounds. My husband and I ordered our burgers medium and found that they were so juicy we barely even needed ketchup. The restaurant doesn’t make a big deal of the fact that their meat comes from humanely raised animals, betting instead that customers will be able to taste the quality difference between a Loaded Burger and a Big Mac. The Loaded waffle choices include BBQ Brisket, Southern Fried Chicken, and BBQ Bacon and Pork Belly, each stuffed inside two homemade waffles. 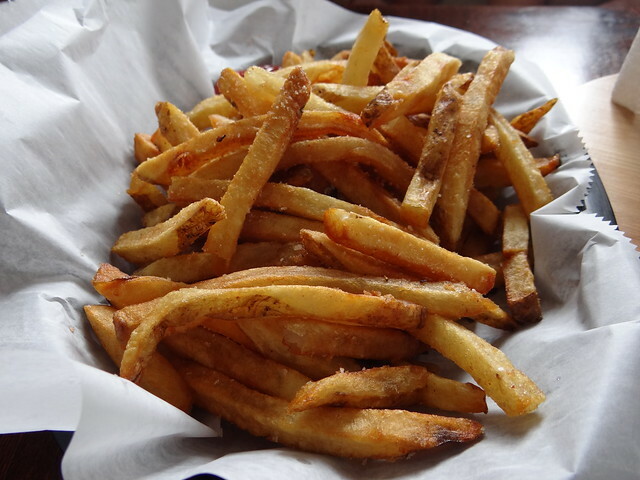 Customers can even choose which variety of “fry dust” they would like sprinkled on their French fries. The “fry dust” choices include vanilla sugar, sweet and salty, and spicy, and is provided by nearby local business Savory Spice Shop. Before opening the owners were hopeful they could expand within 18 months. The year isn’t even up, and they’ve already received interest from the neighboring town of Cranford for an additional location. The new restaurant would be larger, offering them the opportunity to significantly expand the menu and offer signature burgers, additional barbecue options, desserts, catering, and delivery. Looking down the road, other ideas in the works include a food truck and restaurant concepts based around Weiners-n-Wings and Noodles-n-Dumplings. The months ahead may be filled with a number of changes, but the owners have made a vow to maintain the quality and keep customers coming back for more.